Artist Lisa Milroy speaks with Estelle Thompson, curator of the Oriel Sycharth Gallery about her showSocial Fabric, which opens at the Oriel Sycharth Gallery on Monday, October 12, 2015. The exhibition Social Fabric is an invitation to consider how the everyday activities of ‘choosing’ and ‘making’ contribute to our sense of identity and the construction of the self. It presents paintings selected from the past twenty years. A Day in the Studio, 2000, acrylic on canvas, is pivotal to the exhibition’s theme. This painting depicts a time chart of the artist’s everyday life in the studio: getting up in the morning and arriving at the studio to prepare for work. Time passes, the artist paints, until she decides to finish for the day. She locks up her studio and leaves, perhaps until the next morning when she will resume and reiterate the same cherished routine. 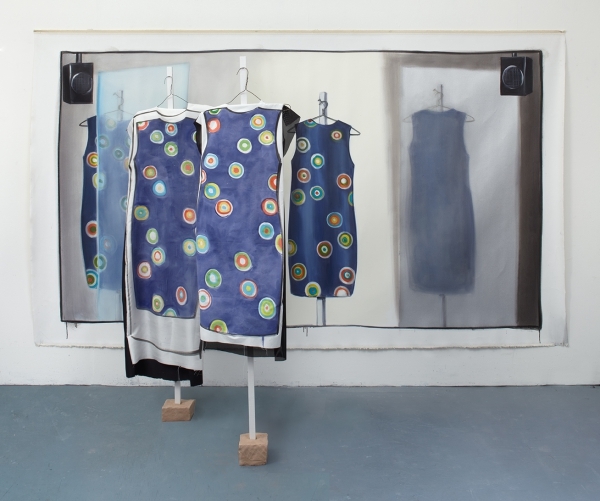 Throughout the day, the artist is repeatedly shown changing her clothes – nightgown, shirt and slacks, outdoor coat, studio clothes – to accommodate each activity. The painting depicts the threshold between internal and external worlds (site of imaginative engagement), and the transformation of concepts and materials through making. While Social Fabric presents paintings of items of clothing and shoes, motifs that have remained constant in Milroy’s practice since she began her still life depictions of ordinary objects in the early 1980s, the body is also always implied and sometimes present. Recent interactive paintings, such as Off the Rails, 2011-14 directly involve the viewer in choice, testing notions of subjectivity, self-identification and taste, and keying aesthetic pleasure. Lisa Milroy was elected to the Royal Academy of Arts in 2005, and is Head of Graduate Painting at the Slade School of Fine Art, UCL. She is currently an Artist Trustee at Tate and the National Gallery. Milroy won First Prize in the John Moores Painting Prize in 1988. Her work is held in many public and private collections. The Private View for Social Fabric is on Monday, October 12, 5-7pm. The exhibition is open from Monday to Friday, 9.00am – 4.30pm, and closes on January 22, 2016. This was an amazing experience. Thanks so much to Estelle Thompson for organising it! A VERY enriching experience. « A TREAT of an afternoon at Yew Tree House, Welsh Frampton! !